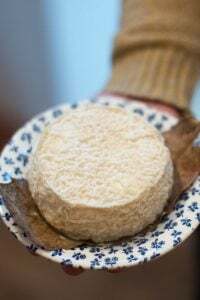 Way back when, after I arrived in France, I wanted to also be in the south of France, in Provence, and I did go off on the lookout in Paris for a large, sturdy mortar and pestle to make all those Provençal favorites, like garlic-laden aïoli and soupe au pistou. I didn’t know what a mortar and pestle were called in French at the time, so I went into cookware shops, made a fist around an imaginary cylindrical object in front of me, and shook it up and down maniacally and with great vigor to get across the idea of what I was looking for. Suffice it to say, I got plenty of odd looks—I’m still not exactly sure why, but no one was able to figure out exactly what it was that I was after. Eventually I got with the program, and learned the name, and found a few pretty mortars and pestles usually made of glass or something equally unstable. 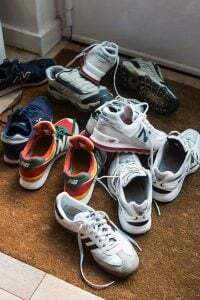 But for all the pounding in Paris that I planned to do, I needed something that’s going to take it like a man and hold up during the rigors I’d put it through in my kitchen. 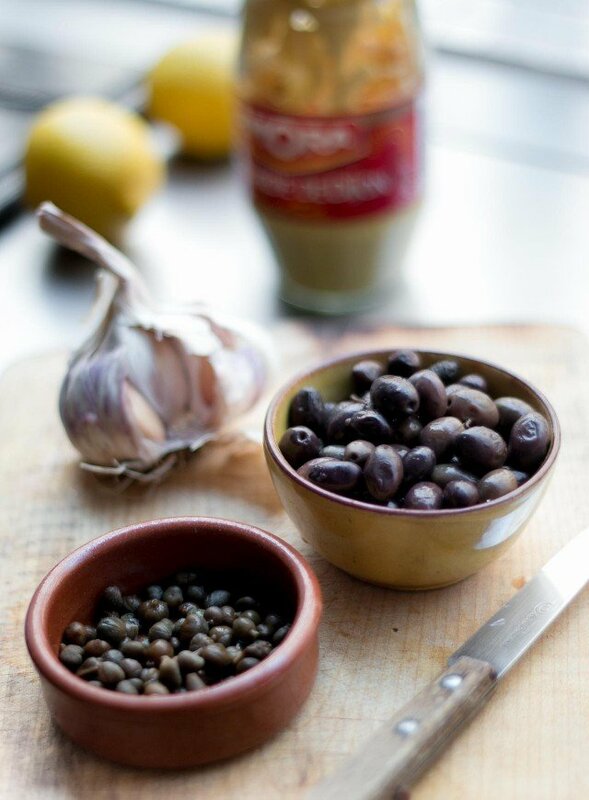 Especially for making a batch of tapenade, a pounded paste of olives and capers, a dash of mustard, some garlic, and a slick of olive oil. For years I pounded away alone at home, making a batch a week of tapenade, squeezing those olives and squirting oily juice all over the place, then pounding until my arm felt like it was ready to drop off. During my days as a pulp pounder, I learned a few tips: One is to rinse the capers and wring them dry with your hands to get rid of any briny taste. And using good olives was another one tip that goes without saying. But like most men of my ilk, soon I started to cheat, albeit on myself, and began buying the olives that were already pitted. Then, for some reason, I bought pre-made tapenade, which is widely available in Paris. And not bad! Fortunately the earth didn’t open up and swallow me whole and life as we know it didn’t end. 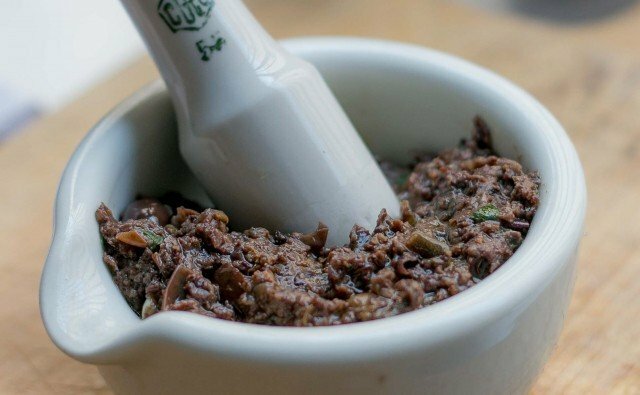 However at some point, the call of making my own again returned, and I was happy to return to making my own tapenade, which is much, much better than the stuff you can buy – no matter where you live. 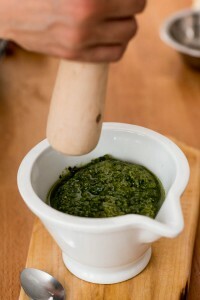 Tapenade is very versatile and can be used a number of ways rather than just as a spread on crackers or toasts. Spread a thin layer of it between the skin of chicken breasts or thighs before roasting. Put dabs on hard-cooked eggs and top with chervil for you next cookout. Spread it on a sandwich instead of mustard or mayo, or fold some into an omelet with some creamy-smooth goat cheese. If you need a quick dinner idea, toss it in pasta as an instant sauce with chunks of fresh cooked or good-quality canned tuna, adding cubes of feta at the end. One tapenade that I’m particularly fond of is this one, a Fig and Olive Tapenade with plumped dried figs. 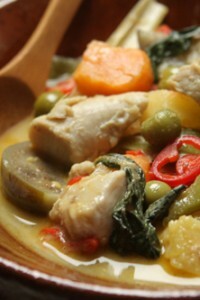 The fruits not only taste terrific with olives, but decreases the amount of pitting and chopping you’ll need to do. 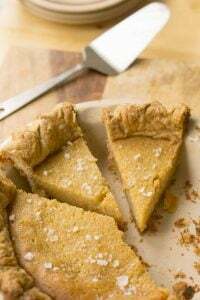 This recipe was adapted from a recipe by the cheery and charming Carrie Brown, owner of the Jimtown Store in Healdsburg, California, and is also in her book, The Jimtown Store Cookbook. And I also like the crunch of the little seeds in the tapenade. Give this one a try. 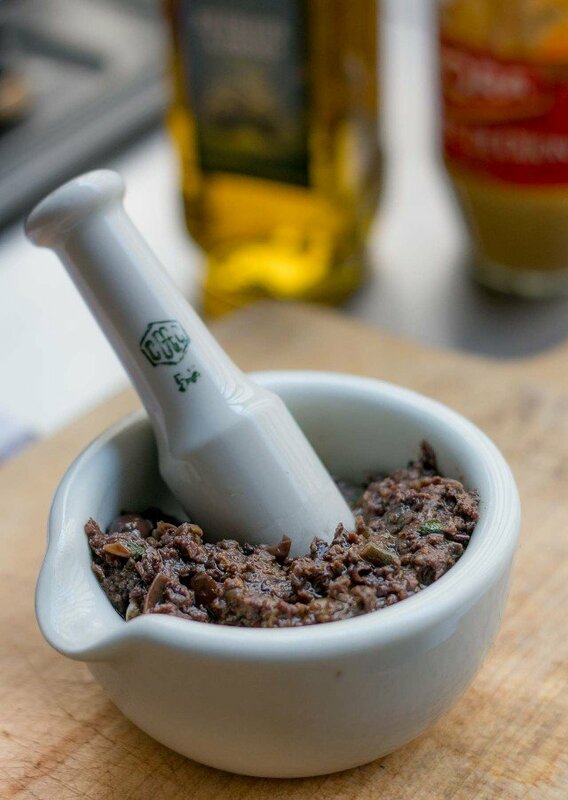 But if you’re looking for a more traditional tapenade, you’ll find a recipe in My Paris Kitchen, along with a few other of my favorites, like Green Olive, Basil and Almond and even an Artichoke Tapenade that you’re sure to look as well. Adapted from The Sweet Life in ParisIf using a mortar and pestle, I find it easier to hand chop the olives a bit first before giving them a good pounding. 1. In a medium-sized saucepan, simmer the figs in the water for about 30 minutes, until very tender. Drain, reserving a few tablespoons of the liquid. 3. 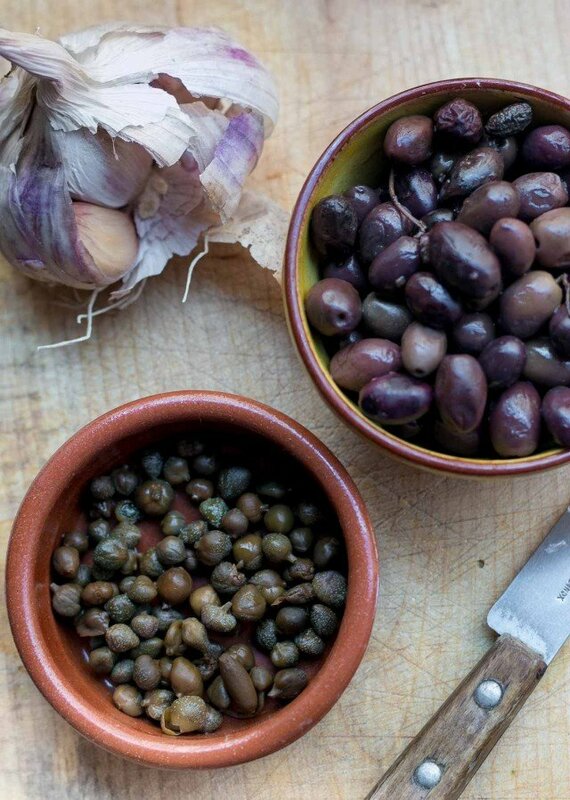 If using a mortar and pestle, mash the olives with the mustard, garlic, capers, and fresh rosemary or thyme. Pound in the drained figs. 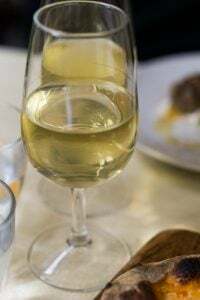 Once they are broken up, add in the lemon juice, olive oil and season with salt and pepper, and fig juice, if necessary. Serve tapenade with slices of baguette or pita triangles that have been lightly brushed with olive oil and perhaps sprinkled with salt and fresh thyme, or a dusting of chili powder, then toasted on a baking sheet in the oven until nice and crisp. Note: A tip from Carrie is to make this tapenade at least one day before you intend to serve it, which allows the flavors to meld and develop. I am definitely trying this – I love olive tapenade and it’s sometimes the only condiment I can stand on my panini and it’s not cheap here. Thanks for the recipe! Must be on the same wave length today, I just sat down with some wonderful green olive tapenade and fresh local goat cheese spread onto a slice of my favorite crusty sesame levain. It’s true, a good barquette of fresh tapenade can’t be beat. At the Uzès market this morning our local olive producer had 3 kinds, black with anchovies, green with basil and garlic (pistou) and another with sundried tomatoes. I absolutely agree, there’s no reason to make your own, leave it to the pros!! David, I’m not sure this post is safe for work. Holy innuendos Batman! (And don’t act all innocent..) Just make sure there is some of that tapenade left when I come knocking on your door next week. I need to go take a cold shower now..
MFK Fisher used tuna too. I made her recipe recently and it’s actually really good, but I’m still more of a tapenade purist at heart. This fig version looks delish! Thanks for the recipe. 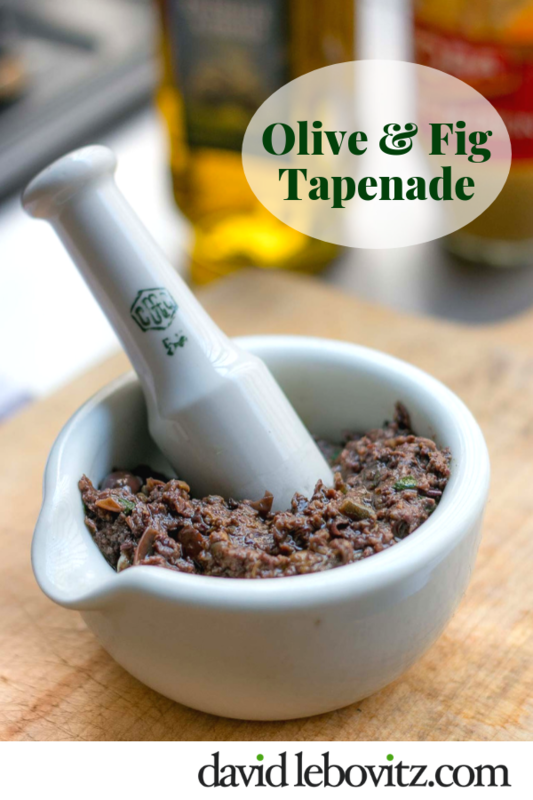 Fig and olive is my most favorite tapenade, too – though I use an adaptation of an epicurious recipe that ups the ante with toasted walnuts, as well. So good! Oh my, I can’t stop laughing at this. Lance Bass…versatile…spread! I am a tapenade whore (seriously). I love making it with green olives and serving it on toasted baguettes alongside dirty martinis. My husband makes a great tapenade recipe, which I’ve stolen and copied once or twice (we’re a bit territorial about the recipes; I tend to find, then he steals and develops, then I complain when he takes the credit — I’m petty, what can I say?). But altho’ he can wield a mean pestle, he generally relies on our ancient Osterizer. Recently, though, our chef daughter gave us a fabulous KitchenAid food processor and he’s started to use that for the tapenade. I find the texture too smooth and prefer the less-efficient blender. Now I’m thinking it would be worth trying the mortar-and-pestle version to see if I like that presumably-rougher texture even better. And altho’ I do occasionally buy a good-quality processed version, that fig and olive version looks as if it could be my new favourite (and I really like that yoghurt idea). Sara: There were so many opportunities to make Paris Hilton jokes that I didn’t know where to begin. But I decided the poor dear has suffered enough. And to be quite honest, it’s like shooting fish in a barrel. While visiting Pittsburgh for a convention, we stopped by a restaurant called Sonoma, and I wound up with fettuccine with lots and lots of delicious tapenade as the sauce underneath some sirloin kabobs. Needless to say, I was quite pleased – haven’t had such wonderful tapenade before. Any chance you’ll give up your mortar and pestle source in Chinatown (the 13th, I’m assuming)? I’m in the market for a set myself and your post makes it seem all the more urgent. Cheers. Sheena: I got mine at the Paris Supermarket (I think it’s called). It’s in the centre commercial near Tang Freres and is the big store with the blue front. Most of the shops around there carry them, and they cost about 13€. I’d been looking for a big old one but they were hundreds of euros when I found them. 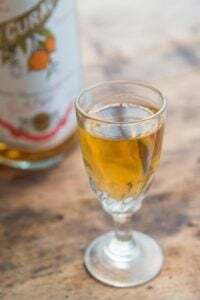 elarael: I prefer the mortar & pestle since I like the coarse texture. Krizia: You’ll note I mentioned several olives that make great tapenade. Best to go somewhere where you can taste them, or buy a few of each and take them home for the tasting. Tiny niçoise olives are perhaps the sweetest, although they’re a chore to pit. A hilarious post! I am sure that you had some interesting offers as a result of your mortar and pestle shopping. When I first starting reading your post I clicked through thinking I shall have to mention my favourite tapenade from Jimtown and low and behold. . . you already did! We first had this when we went to the Jimtown store a few years back. Unfortunately they do not ship to Canada but we have found it in NY and Chicago. 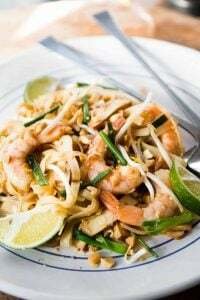 I searched on the net and found the recipe and have made it many times with great success. 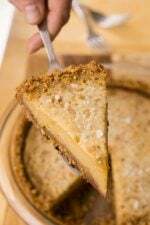 We enjoy the combination of the sweet and savoury! Just included Annie Somerville’s recipe for tapenade made with picholine olives in a food story for next week (on pique-niques, as opposed to picnics). It’s a bit less salty and has a slightly crunchier texture and I love it. I was happy to see your inclusion of the Jimtown Store fig and olive combination, which we’re lucky enough to be able to buy, here in Marin. I support your idea for purchasing the best ready-made condiment, and like your suggestions for using it beyond appetizers. Merci! I’m a big cheater and use a food processor. I guess it’s ok since I’m not living in France, right? 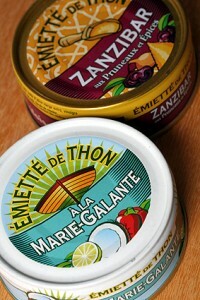 I try to use the best olives but have been known to use the pitted kind, I admit. If you have to buy it ready made, may as well buy a product worth eating, right?